Spirit QuartzMy is an unusual member of the Quartz family – a community within a stone. Its core, a larger, candle-shaped crystal with a faceted termination point, is encrusted with hundreds of smaller crystal termination points. 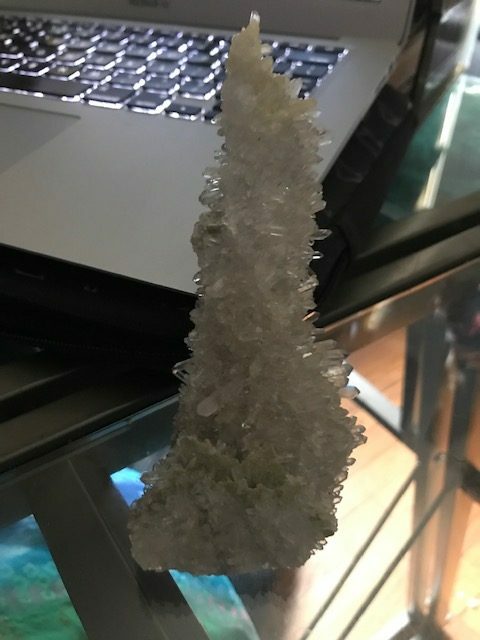 AKA Cactus Quartz or Porcupine Quartz, it is from the Magaliesberg Mountain region of South Africa, according to Crystal Vaults. “Mountains” came to Muhammad (us): At a celebration of healing energy sponsored by my teacher Peter Goldbeck, an exercise revealed crystal caves or caverns for two of us. It was within our mind’s eye, the first/third eye and 6th chakra/vortex. We both saw mountains’ insides! While Lara worked on us, Michael saw an amethyst cavern and I saw a Himalayan salt cave or it could have been a cavern of rose quartz. The pink color was indisputable– it resembled the salt lamp on The Board Room table where we met at The National Opera Center in NYC. This got me to thinking about stones, rocks and minerals –of course, gems– and how they represent the first technology. It is likely their use preceded the wheel. Anyway, the Creator has allowed me to share with you this bit of appreciation and thus this post. Reflecting on the recent weeks, my head congested with a sinus infection according to dear Dr. Alina Tyndall of Hillside NJ, I realize the few stones I own have reinforced my disposition to happiness. This goes way beyond their use as adornment and I am enjoying my mother’s amber and lapis lazuli jewelry, thank you very much. The influence and importance of beautiful jewels, stones and crystals is often hidden in plain sight. Depicted here are the dalmatian jasper stone and the spirit quartz sitting near my laptop. I see a face I never saw before in the dalmatian. Do you see it? Looks like something from Easter Island…. In fact, in the evening that I first put the dalmatian on my laptop, I found myself watching a few comedy videos on YouTube. I indulged because it was the weekend. Then I realized later that the dalmatian stone actually encourages lightheartedness. As Crystal Vaults put it: “If life has become burdensome and all sense of joy seems to be lost, wearing or carrying a Dalmatian Stone can reawaken a sense of fun and humor.” So needed during my recovery from sinus shut-down! I gotta say my stones have me present to feelings I just LOVE. “I am serene and fulfilled” is my newest affirmation. We can hold the grandness of the mountains in our hands if we so choose. Do you now see how this connects to energy bodywork, healing and Reiki described on this website? As our community of human souls continues to be distracted by obvious and undetectable energies, such as electromagnetic frequencies (EMFs) and more, the need to connect with our mountain aspect, pure rising earth, is apparent. Pure in this case means uncontaminated. The material has not been permeated by EMFS or the effects or inhabitants of other dimensions (spheres of being or reality; a subject explored in physics). Is it Nuummite or Larkavite? We have to accept that the rock and mineral kingdoms are communities, like and unlike the human community. They can help us to reconnect, ground and center ourselves. This article from the National Institutes of Health discusses “grounding” as a physical science word, not a woo-woo spiritual word. Research and uncover to confirm religious connections: Holy Quran (6:38; 33:72 below); Bible, this article describes the role of mountains and this is a sermon about the role of “precious” stones in creation. I’d love someone to share passages from Bhagavad Gita, Ifa, and other wisdom scriptures on this subject. The bottom line is, stones are from mountains and are for our use. Science verifies the properties of these crystalized and metallic materials of high-rise Earth, Gaia, terra firma. Stones are literally our foundation, which should support your embrace and use of them, if you have been hesitating. 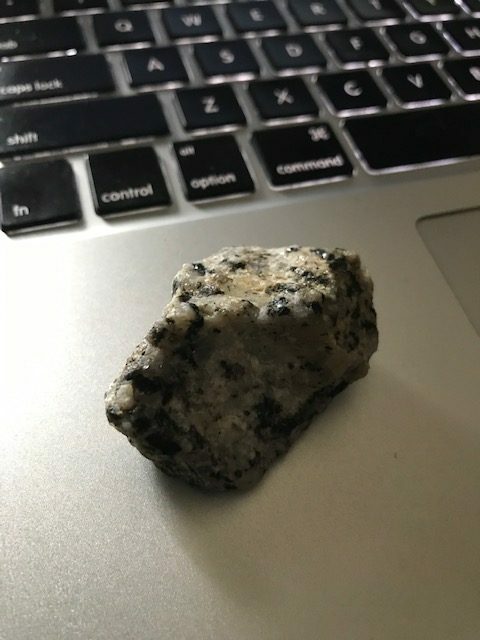 Someone’s Larvikite stone according to Google. One more thing. I have an unnameable one that eludes identification. Could it be nuummite or larvikite? 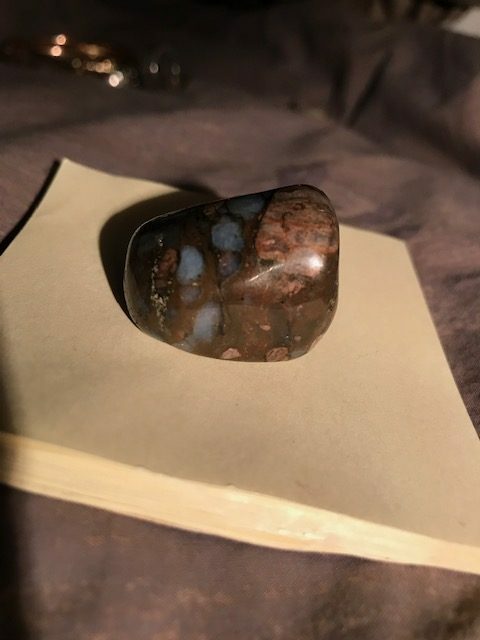 Online I saw a larvikite that had sky blue inclusions like my stone but well, different. Most images are grey or black and mine has a brown background. There also seems to be some jasper inclusion in my stone. Do you see it? Second bottom line, when I meditate or sleep with this stone, I feel more “cleared” and inspired. 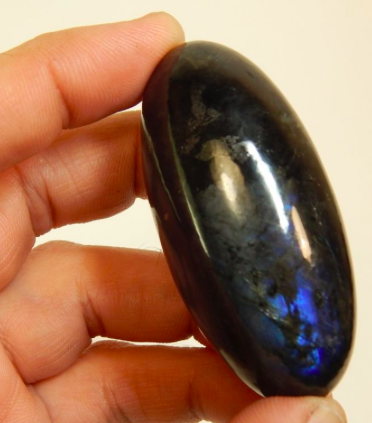 Researching some more, I’ve learned larvikite is also known as black labradorite. This is another stone I love, but I can’t put my hands on mine right now to share a pic with you 🙁 . This post was written with Harmony on the heart. Go here and search for the ingredients in this special essential oil blend. HQ Al-Anam (Livestock) 6:38 All the creatures on earth, and the birds that fly with wings are communities like you. We did not leave anything out of this book. To their Lord, all these creatures will be summoned.